Spencer Bautista, Jacob Thierfeldt, MacKenzie Sakala, and Oliva Lang of Tobacco Free CCA showing how much they love NY. RC Program Coordinator Joseph Potter and RC State YAYA winner Lauren Cybul meet with Assemblyman Joe Errigo on the NY State chamber floor. RC Program Coordinator Joe Potter, RC Youth, and Senator Funke in the senate chamber where Funke wrote a resolution (award) for Lauren Cybul for her advocacy efforts. Pictured left to right are Caitlin O'Brien from the American Cancer Society, Deb Mendzef CNY Regional Center for Tobacco Health Systems, Senator Pamela Helming, Waterloo Reality Check Youth Kim Page and David McCarthy, and Brigid Heenan Community Engagement Manager and TACFL. Herkimer and Fulton RC Youth bringing their message to Senator Tediscos' office. RC youth receiving words of encouragement from Senator Fred Akshar. Senator Crouch taking a moment to listen to RC youth from Norwich. RC youth from Fort Plain, NY spending time with Assemblyman Angelo Santabarbara on the floor of the Assembly at the State Capitol. Senator Kevin Parker couldn't pass up an opportunity at the RC selfie station. Reality Check youth from St. Lawrence County check in with Assemblywoman Addie Jenne at her office at the state capitol. Senator Griffo's staff member took the time to meet up with of few RC youth. Below, RC youth meet with Assemblyman Brian Miller at his New Hartford office. It appears they have a few messages they wanted to bring to his attention. On the left, youth have an opportunity to discuss what RC means to them with Joshua Bailey who is the Legislative Assistant for Senator James Seward. On the Right, Senator Seward meets with RC youth Jasmine Neil and Jillian Johnson. 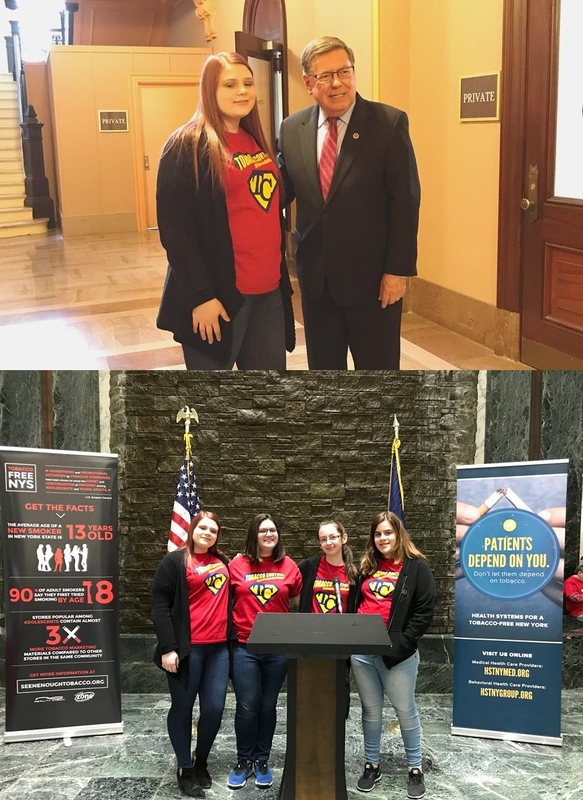 Youth from Cortland and Tompkins Counties took their messages to Albany on Legislative Day. It appears they had listening ears.